It seems like Maybelline's new Last Stiletto Mascara is everywhere these days. From TV to the blog scene...I was fortunate to get my hands on it. I'll make this review short and sweet because I know some of you are already familar with this product. 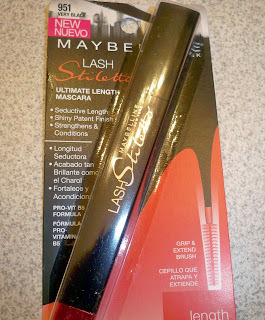 My lashes are super short, straight and sparse so this mascara needs to work wonders! The concept of this mascara is really cute...shaped like the end of a stiletto. The brush is tiny with very spiky bristles to catch the lashes. Check out the before and after. My non-existent lashes to added length. Here is a another close-up. I used Lash Stiletto with a volumizing mascara in familiar bright orange tube and whoa, I quadrupled my lashes. 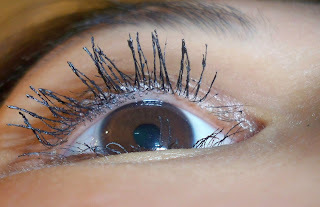 They could use a comb through to separate the lashes but what a huge difference right? To get the best results, pair this with a volumizing mascara and your problems are solved! This post would freak out my friend. She's scared of seeing eyes up close. I've been wanting to try this! Thanks for the review. thanks for the breakdown ren. that is a big difference. although girl you still need to try plushlash! I've been using this mascara for the past 2 weeks and I like it so far. It doesn't give much volume but does lengthen. But then again, I put like 3 coats of mascara on and curl them once again after they dry....lol. I got this too!!! I got it at Rite Aid a few days ago because it was buy one get one free!!!!!!! Ahhhh! I need to try that one! It really does lengthen! I am such a skeptic when it comes to mascaras. Thanks babe! Ren! Just catching up on the blog pretty lady, glad you decided to take some time off! New Orleans sounds amazing, but tiring of course. Next time you need to go to a deserted island, or some place where you can REALLY relax! I'm sure my wedding contributed to your exhaustion! But you're STILL up and running!